There´s no doubt, French Fries have earned their salience in our Potato Specialties catalogue, with their different cuts (wedge chips, disc-shaped, diced, etc.) and different sizes (7mm, 10mm, etc.). 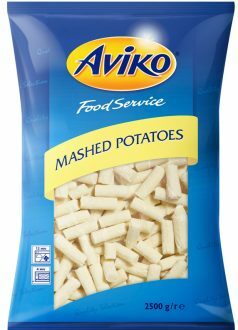 Beyond that, under the brand Aviko we boast a wide range of pre-cooked potato based products, such as gratins, small bites, croquettes or purées. We would like to look into our Mashed Potatoes, with an unbeatable “homemade” flavour and quick preparation. Aviko mashed potatoes are the proof that it is possible to make a light potato purée, with a “homemade” flavour in record time. Made in traditional fashion, with butter and fresh milk and frozen afterwards, they preserve all the vitamins and flavour at its best. Furthermore, thanks to its individual portion presentation, it may be prepared in a quick, simple, convenient way, regardless of the number of eaters. It´s frozen individually in 35 grams portions, and it´s ready to serve in a few minutes in the microwave, without having to add anything to it. Another advantage is the 24 months shelf life, from the production date. In order to fully cover our client´s needs we present two varieties of mashed potatoes. On one hand we have the classic Butter & Milk, very creamy and with a soft and delicate texture. For those who prefer a more homemade finish, we are proud to present Homemade, with a thicker grind and prepared with fresh butter and a sprinkle of nutmeg. In sum, we offer mashed potatoes for every taste bud, with great quality, homemade flavour and quick preparation. More info available HERE on our Potato Specialties.